Last month, the Business Design Centre in Islington, London, hosted the 22nd London Art Fair, the largest British and contemporary art showcase in the UK. From 13th to 17th January, the Fair brought together over a hundred leading British galleries, a selection of international projects and a showcase of contemporary photography. It included the highest-quality paintings, sculptures, drawings, installations, photographs, video and editioned prints and multiples. A great success, this edition attracted over 20,000 visitors, including major collectors and directors from public galleries and institutions. 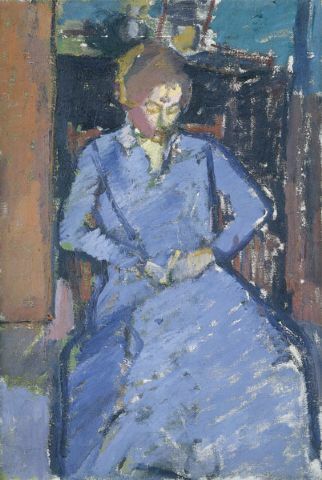 Major sales included a large Alan Davie painting from the early Sixties at £120,000, the Blue Dress (oil on canvas) by Harold Gilman for £95,000, as well as works by Alex Pearl and Thomas Allen. It was also the fourth edition of Photo50. Fifty works, selected by a distinguished panel that included Ekow Eshun (Institute of Contemporary Arts), Anita Zabludowicz (176 / Zabludowicz Collection), David Campany (writer and lecturer on history and theory of photography) and a team from Goldsmith’s MFA curating program, were shown and championed by the members of the panel. The selection included a broad range of approaches to contemporary photography with established artists such as Dan Holdsworth alongside recent graduates and figures better known for their work in fashion, music and advertising. The 2010 edition of Art Projects, featuring several international galleries – whereas the London Art Fair traditionally concentrates on supporting British galleries – brought together 25 projects from emerging artists. Having been established as one of the most exciting sections of the Fair, photography was a large part of this year’s edition, with French photographer Vincent Fournier’s uncanny interiors of Chinese, Russian and USA space agencies – the result of 15 years of persuasion to access state and government stations and training grounds, photographs from the Forties and Fifties covering the early history of atomic and nuclear bomb program, as well as a group show from artists responding to the conflict in Northern Ireland and other projects in the same vein. This edition also presented a large number of installations, including Sue Morgan’s fictional voyage inside the human mind with maps, collages and etchings or Gabrielle Le Bayon’s live feed interactive projection piece. The next edition of London Art Fair will take place 19th-23rd January 2011, so put the dates in your diary now!